The Zune has to accomplish many feats if it is to achive main-stream adoption, and yes these include many technical and marketing feats, but one of the most important aspects of the Zune's success is how it is displayed in retail stores around the world. 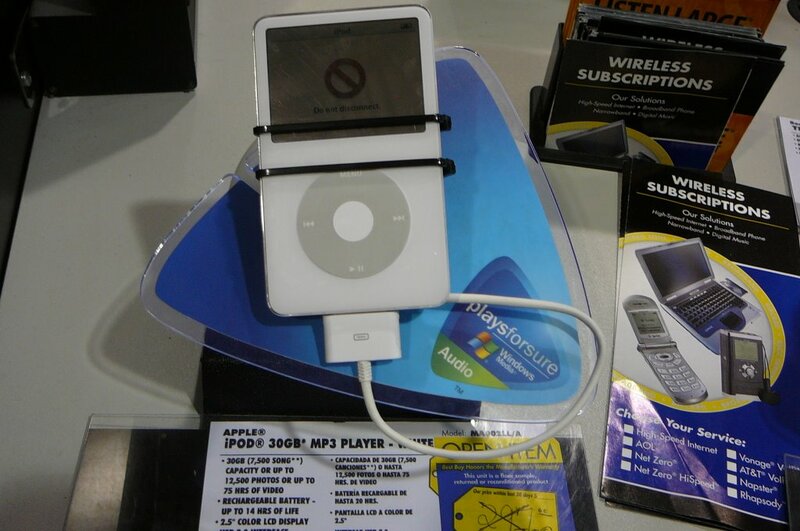 This may sound silly at first, but think about it, the iPods and mp3 players on display at Bestbuy are normally locked, scuffed and scratched, broken, or not plugged in. 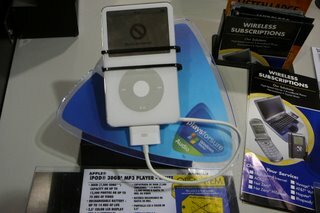 This does not make the products jump off of shelves (below is a picture of the iPod on display at my local Bestbuy, this is one of the better displays I've seen in a while also...). Apple has the benefit of having their chain of Apple Stores scattered across the country. 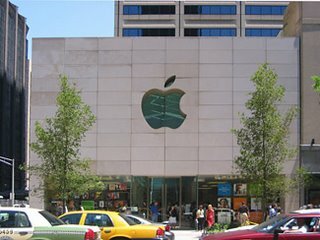 Here, visitors are ushered in by helpful Apple employees, Sparkling new products presented in top notch fashion to play with, and an amazing atmosphere that just screams "BUY ME!". The key here is that visitors can really experience the device in an environment controlled by Apple, thus, they experience whatever it is Apple wants them to take away from the product. It is here that Microsoft is at a serious disadvantage, because they are not creating another run of the mill MP3 player...they are adding many new features and aspects to the Zune that really must be featured by the average customer to be fully comprehended. But, as I stated above, Microsoft is forced to rely on the knowledge of your average Bestbuy employee to archive this. This makes it imperative for Microsoft to work on ways to showcase and highlight their product in new ways, or nobody will be itching to buy one. At this time I am not sure about how this could be accomplished, but I know that it must. 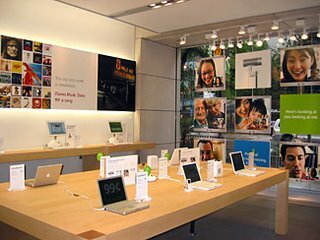 I doubt the Zune displays will be able to replicate the atmosphere or delight that the Apple stores are capable of creating, but then again, I would love to be surprised. "trust me we've thought this through very carefully but we're into some areas where there will be some nice surprises this holiday and we need to keep them under wraps for a while." Don't forget to subscribe to our feed at the top right corner!